Meetings were changed to evenings to accommodate many people who could not meet in the daytime. Members of the I.B.C. participated in a 1/2 hour television program, "A Bonsai Workshop", on Channel 20 with Bev Oliver moderating. Bev Oliver, the club's founder, passed away in February. 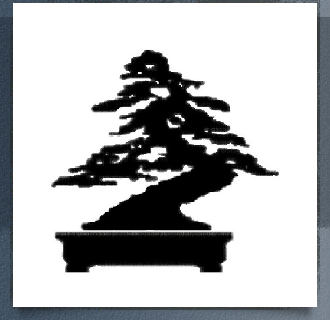 At the March meeting of the I.B.C., the membership voted to adopt the silhouette of Bev's first, and perhaps most prized Bonsai as the Club logo. The tree is a procumbens juniper and appears on our club newsletter as well as on club stationery, and this web site. Bev's juniper has also appeared on the cover of B.C.I. magazine.